Ready for an online experience that's fun for you and your entire family? 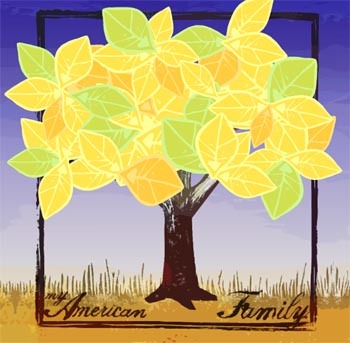 Welcome to the American Family Interactive Tree. The Tree gives you an opportunity to create a special kind of family tree -- a tree that not only allows you to show the people who compose your family, but to tell their stories. And by telling their stories, you'll create a picture of your family as a whole that shows why it's unique. You'll also be creating an invaluable family history. You'll answer questions about where and when family members were born, what their interests are, what moments have shaped them, and many others. If you don't have all the answers, don't worry! You'll be able to e-mail members of your family about the tree, and they'll have the ability to help you complete it. And when the tree is done, you'll be able to print out the information entered for each family member. It's time to tell the story of your family. Get started! Want to tell your family�s story visually? Build a family album using one of our 24 patterns!